Twelve Centennial Park is an exquisite high-rise building in Downtown Atlanta. This building is designed to make living fun. There’s an outdoor terrace with a pool, sundeck, grill and bar; a club room with plasma TVs, internet kiosks, catering kitchen and wet bar; state-of-the-art fitness center and a beautiful restaurant and lobby bar. The homes are spacious and open with 10’ ceilings, top of the line kitchens with wood cabinets, granite countertops and stainless steel appliances, and all are pre-wired for cable, DIRECTV and in-home audio. The icing is your large, private balcony with amazing city views. 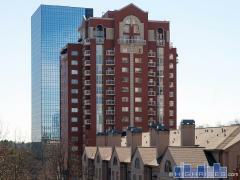 This condo tower is a member of the Twelve hotel chain, with a sister property in Atlantic Station. This particular Twelve building is perfect for heavy travelers, with its immediate access to a Marta bus and train station just downstairs. Have any comments or questions about Twelve Centennial Park? Ask your question and/or share your thoughts about this Building. I would like to know how do you get in touch with someone about possibly owning a condo that is empty. Thank you!